If you’ve been thinking about improving your smile, but put it off due to the cost, now is the time to come in for a free consult! We believe in building lasting relationships with our patients by delivering high-quality services and patient care. Our patients think Lifetime Dental Health is the best dental experience they’ve ever had. Find out what our patients have to say about us. Welcome to Lifetime Dental Health, your trusted family and cosmetic dentist in the Upper Arlington and entire Columbus, OH area! 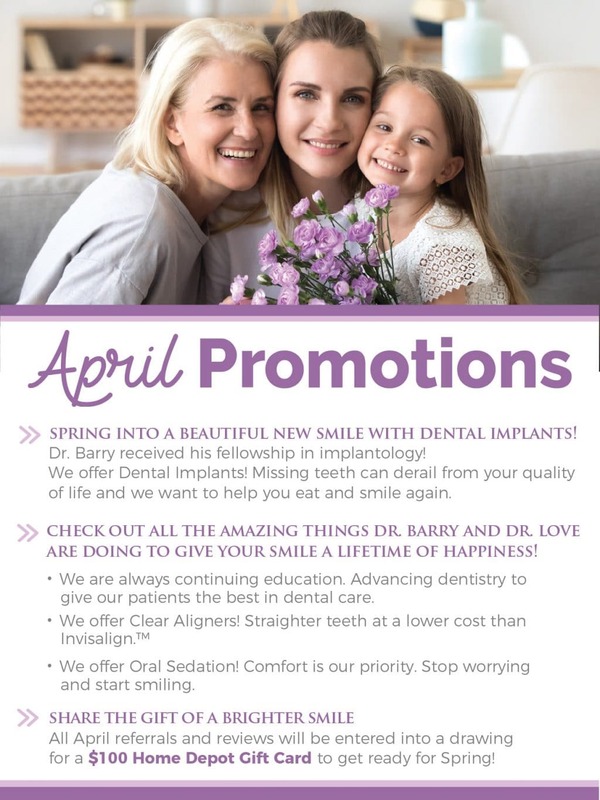 Dr. Barry and Dr. Love with our outstanding team are proud to provide you with compassionate care and quality dental solutions that last a lifetime. We have been voted Top Dentist every year since 2011. Our modern office is fully equipped with cutting-edge technology and the friendliest staff. We love being able to serve our Columbus patients’ dental needs at every phase of life. It’s no wonder we have patients whose families have been coming to see us for generations. Dr. Barry and Dr. Love hold a very high standard of care, and have selected each of our team members accordingly with a commitment to upholding that standard. gentle treatment and beautiful results. Whether the newest addition to the family needs to come in for their first dental cleaning, dad needs a crown, or grandma needs a new set of dentures, you’ve come to the right place! We are happy to provide a wide range of services to meet all your family’s dental needs under one roof. Our exceptional hygiene team is dedicated to providing the best dental cleanings in Upper Arlington and Columbus. They are incredibly gentle, compassionate, and attentive to your needs, and with a hawk’s eye for detail, you can rest assured they won’t miss a thing. If you are like millions of Americans who are living with a smile that is less than perfect, our team at Lifetime Dental Health in Columbus wants you to know that you don’t have to grin and bear it. A smile can speak volumes without you ever saying a word – is your smile sending the message you want it to? If not, we would love to speak with you about our cosmetic dental solutions. Dr. Barry and our team are firm believers that prevention is the best medicine. We would much rather see you twice yearly for your regular cleanings and check-ups than have to replace teeth damaged by decay. That’s why we are committed to educating all of our patients about the importance of oral hygiene, and minimizing risk factors for disease and decay. At Lifetime Dental Health, we understand the importance of taking care of your family’s health. We also understand that health and dental care can be costly, especially if you have no insurance or out of network insurance. That’s why we are happy to offer flexible in-office financing options to help you get the care you need without breaking the bank. Accepting New Patients from all over the Columbus Area! Marysville, Delaware OH, Powell, Dublin OH, Grandview, Upper Arlington, Worthington, Hilliard, New Albany, Westerville, New California, Plain City, Gahanna, Lewis Center, Grove City, Reynoldsburg and surrounding Columbus OH area. Do you have questions or concerns regarding billing or payment? Please e-mail inquiries to: billpay@lifetimedh.com, and we will respond as promptly as possible. Our goal is to keep your teeth healthy for life, which requires a life-long relationship with a dental practice built on trust. Dr. Barry and Dr. Love have extensive experience and training in all aspects of dentistry.